The Teach Yourself Visually series of books contain clear step-by-step, descriptive instructions on how to get the most from your Mac. This title tells you what to look for when buying a new Mac mini. It also provides some good advice about peripherals that you can purchase for your machine. This is a great book for the new Mac user. Buy it before you purchase your machine and it will pay rewards. I eagerly looked forward to reviewing Teach Yourself Visually Mac mini. One reason for this was my skewed expectation that it would focus on Mac mini hardware. Although the book covers what to consider when choosing a Mac mini, the content is really about how to use the machine and the operating system that comes with it, Mac OS X. This book can be used as a manual. The first few pages give you instructions about how to use the book. The chapters are color coded, and the table of contents provides a clear view of where you need to go if you are looking for answers to a specific question. You can read the book from cover to cover and new users may well be advised to do this, certainly for the first few chapters. But a computer, and life in general, is never that ordered. I have to admit I got through the first part of the book quickly. This is where hardware and accessories are covered. Teach Yourself Visually Mac mini covers a previous version of the Mac mini. The only differences with the current version may be the processor and memory details; not much of a concern. The following chapters cover the use of the operating system. In this case, it’s Mountain Lion. At the time of this review I hadn’t switched to Mountain Lion, and this book explained what to expect. Each chapter’s step-by-step guides are accurate. This is crucial for a complete novice; less so for more experienced Mac users. There are frequent tips at the end of each section. The tips are nuggets of gold; skip over any of them at your own peril. Teach Yourself Visually Mac mini covers topics from sharing your mini with others to managing your files and folders. Other chapters include Making the most of your photos to Protecting your Mac mini and your data. At the end of the book there is a troubleshooting guide. Good basic information, but it’s impossible for these guides to cover every circumstance. I found this book easy to read and also handy to use as a guide when needed. I liked it, and I can recommend it. Being aimed at the Mac mini user doesn’t mean that if you have an iMac you can’t use the book. Many of the references cover both machines. Teach Yourself Visually Mac mini isn’t for the seasoned Mac user. I found it useful as a reference. 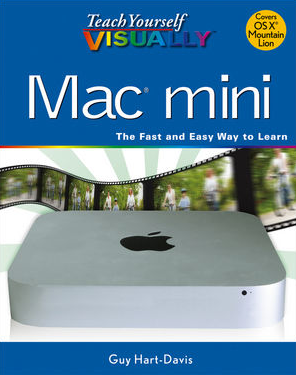 The book is aimed at switchers or computer users who are new to the Mac mini. If you received one of these as a Christmas gift, now is the time to buy this book. MyMac Review Rating is a solid 8 out of 10.